Mother Nature sends an lot of signals to us that we should to pay better attention to. Not all that long ago it was the only way that farmers and vegetable gardeners had to know when to do what in the garden. They planned garden activities based on the birds, bugs and plants. The science of these signals is known as phenology. You have probably heard gardeners mention “it’s time to prune the roses when the forsythia bloom” and chalked it up to old wives tales and garden lore. But there is absolutely science behind it all, or at least most of it. Certainly you have noticed for example, experienced gardeners planting their gardens well ahead of the “safe to plant date” issued by your local garden center. You steadfastly wait for the date to plant but discover that the experienced gardener who pays no attention to the rules has well established plants by the time you turn your soil over. You may often wonder, how on earth could that gardener know it wouldn’t frost again or is it just luck? In most cases it is not luck at all. That gardener was watching for certain signals from Mother Nature to know when to plant. Of course research and experience also told that gardener which plants are most tolerant of cold nights and could be planted early. But nature gives a lot of signals primarily by using native plants as indicators. There are no guarantees that the indicators will always be right, Mother Nature can be fickle. Early or last spring can destroy the best of calendar plans, but gardener’s phenology is fairly reliable. Plants are intimately in tune with nature’s calendar. Here are a number of natures signals to gardeners that seem to pretty reliable. 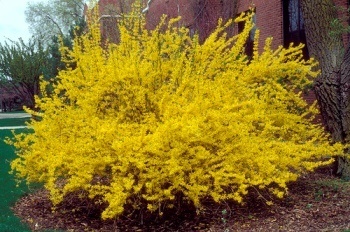 No forsythia in your area? Look for another plant in the listing that is an indicator. There are some gardeners who plan gardening activities based on the phases of the moon, known as lunar planting, astrological gardening, etc. Historically some farmers used lunar phases to guide their planting. Personally, I can only keep track of just so much. And as a gardener I am much more in tune with the plants than the moon. Be careful which plants you take your signals from though, a hybrid daffodil or lilac may not always follow Mother Nature’s rules! And of course micro-climates such as urban heat islands or shade can alter even a native plant’s timetable. If you start paying attention to the signals, you will learn which plants are the most reliable indicators in your area and your gardens. Even the native plants will alter their schedules based on droughts, unusual rainy periods, extreme heat, etc. But perhaps if the native plants have altered their schedule, you should be following their lead?